Yesterday was a big day for me and by the end of the day, I was pretty tired. By routine I visited my blog and there was a little surprise waiting for me! OK it's not little, it is a BIG surprise. 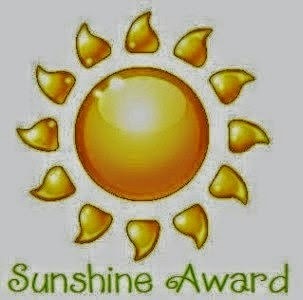 I was nominated for the 'Sunshine Award'. Sushree Dash was kind enough to share her award with me. I had come across Sushree's blog in google+ and just by curiosity I read a post. And ever since, I have been following her blog. She writes fictions and poetry aptly and has a great way with words. And I must add, she is a genius! She can combine multiple prompts and present a single post flawlessly. I was obviously over whelmed when she shared this award with me. Due to my busy schedule I couldn't write about this immediately. I had thought I would write it when I get some time off and mean while, I was nominated again, by a dear friend of mine Sachin Prabhu. My joys were multiplied. 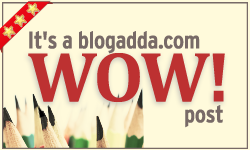 Sachin is my friend since past 2 years and is new to blogging world too! He loves to sketch and click pictures! You can find him doing a variety of things and recently, he had picked up writing too! 1. Sid Balachandran at i Wrote Those. I really don't understand how can some one write so effortlessly! His posts are filled with humor and message in the mean time. 2. Srilakshmi at I am S(t)ri. A dear friend of mine and an awesome writer. Manages to write blog novels filled with suspense that can keep you hooked! 3. Sreeja Praveen at The Alter Ego. I simply love her writing style and the way with which plays with words. 4. Leo at I Rhyme Without Reason. I totally love his narration skills. Once you start reading, you can't stop! 5. Preethi Venugopal at Tulips And Me. Not only a writer but a great artist! Some one whom I respect a lot! 6. Shailaja Vishwanath at Diary of a Doting Mom. Some one who inspires me a lot. Am totally in awe of her. She is the kindest person I met in my blogging journey so far. 7. Corinne Rodrigues at Everyday Gyaan. For her never ending support for bloggers and the beautiful tips she give for us. 8. Shiva Kapoor at Where The Mind Is Without Fear. I started reading her blog recently and I just love it. 9. Bhavya at Ishithaa. Another blog I stumbled upon recently. Beautiful one I must add! 10. Shyam Sundar at Scribbles of an Enigma. Newbie like me but he always keeps encouraging me to write. Thanks for that Shyam. Sorry I did miss out some blogs but I could just nominate ten. Now here goes the next part. I have to write TEN things about me. 1. I am a perfectionist. I can't sit still till I do any work perfectly! 2. I love writing, painting, singing and cooking. I keep on adding things to this list. 3. Though I write freely, I am quite shy when it comes to speaking! 4. People think I am silent, but hold on! That's only for beginners! Once you get to know me, you will be surprised! 5. I am faithful to the people I love, I will do anything to bring that smile on their face. 6. I live for the day when my dad will say that he is proud of me! I wouldn't have any regret after hearing that! 8. I secretly wish vampires and werewolves exist in real and some day I would find them! 9. Most of the times, I will be lost in dream world! It's really difficult to stay put in the present time! 10. Quite sensitive. Though I smile all the time, I take things to the heart and keep thinking about if for long time! That is a beautiful tribute to your mom, Swathi :) Thank you so much for nominating me :) I am really glad that you feel touched by my kindness. What a wonderful compliment to get :) Congrats on the award! Congratulations :) Am so happy for you ! Don't be surprised sreeja :) U write so well!! Very delayed acceptance, but I suppose better late than never. Thanks for the kind words about my narration :) Makes me happy reading it, and hope I can write a story soon. Been a while since I wrote one. Have changed from Leo to Vinay Leo R. recently.